Conversely, I don’t think we can expect Angular’s performance to improve in the same way as browser engines have. While Angular has undergone significant iterative performance improvements in the 1.x series, it is clear from the massive redesign of version 2.0 that most future application performance gains will only be won by rewriting significant chunks of your own code. Be aware! This advice, to move function calls out of loops, really depends on what the function you are calling is. Now, clearly, it’s sensible to move calls out of a loop if you can – that’s a normal O(n) to O(1) optimisation. And Objects.keys, as shown in the original article, is very heavy function, so that’d be a good one to avoid. But don’t take this advice too far. The actual cost of the function call itself is minimal (http://jsperf.com/for-loop-perf-demo-basic/2). In general, inlining code to avoid a function call is not advisable: it results in less maintainable code for a minimal performance gain. While modifications to the DOM should be approached carefully, the reality is a web application is all about modifying the DOM, whether directly, or indirectly. It cannot be avoided! Applying inline styles (as opposed to using CSS selectors predefined in stylesheets?) vary significantly depending on both the styles being set and the browser. It’s certainly not a hard-and-fast rule, and not really a useful one. In the example, I compare background color (which should not force a reflow), and font-size (which would): (http://jsperf.com/inline-style-vs-class). The results vary dramatically across browsers. No arguments here. In fact I would go further and say that this is the single biggest performance concern, both in terms of CPU and resource usage, in Angular. In my limited experience, anyway. It’s very easy to leak closures without realising. I would again urge you to avoid implementation-specific optimisations. Designing an application to minimize the number of properties in an object just because today’s implementation of V8 has a special internal representation of small objects is not good advice. Design your objects according to your application’s requirements! This is a good example of a premature optimization antipattern. Finally, as Wills Bithrey commented, Array.delete isn’t really slow. This is a clear description of Angular scopes and the digest cycle. Good stuff. Abraham does a good job of unpacking the ‘magic’ of Angular. Ok, so in my app I return full rows of data, and there are a few columns I don’t *currently* use in that data. I measured the performance impact on my application, and the cost of keeping those columns was insignificant: I was actually unable measure any difference. Again, this is a premature optimization antipattern. Your wins here will ultimately not be from excluding columns from your data but from making sure your data is normalized appropriately. This is about good design, rather than performance-constrained design. Of course, there are plenty of other reasons to minimize your data across the wire. But remember that a custom serializer for each database object is another function to test, and another failure point. Measure the cost and the benefit. Yes. Never is a little too strong for me, but yeah, in general, avoid binding to functions. Yes, in general, deep watching of objects does introduce performance concerns. But I do not agree that this is a terrible idea. The alternative he gives (“relying on services and object references to propagate object changes between scopes”) gets pretty complicated and introduces maintenance and reliability concerns. I would approach this point as potential low hanging fruit for optimisation. As DJ commented, filters don’t work by hiding elements by CSS. Filters, as used in ng-repeat, return a transform of the array, which may be what Abraham meant? Pretty much. I would add that for custom syncing to work, you still need a unique key, just as you do for track by. If you are using Angular 1.3, there’s no benefit to the custom sync approach. Abraham has detailed the maintenance cost of custom syncing. ng-if and ng-show are both useful tools. Choose your weapons wisely. Yes, if you must. This is a great way to introduce inconsistencies in your application which can be very hard to debug! I really disagree with this advice. scope.$watch is a very practical way of separating concerns. I don’t think it’s indicative of bad architecture, quite the opposite in fact! While trying to find the discussions that Abraham refers to (but sadly doesn’t link to), it seemed that most of the alternatives given were in fact in themselves bad architecture. For example, Ben Lesh suggested (although he has since relaxed his opinion) using an ng-change on an input field instead of a watcher on the target variable. Why is that bad? From an architectural point of view, that means each place in your code that you change that variable, you have to remember to make that function call there as well. This is antithetical to the MVC pattern and seriously WET. Apart from the advice to unbind $on(‘$destroy’) which I don’t think is correct, yes, being aware of the performance impact of events is important in an event-driven system. But that doesn’t mean don’t use them: events are a weapon to use wisely. Seeing a pattern here? Yes. Apart from the advice to “explicitly call your $on(‘$destroy’)” — I’m not sure what this means. Only one quibble here: isolate scopes or transclusions can be faster than occupying the parent scope, because a tidy directive can use $apply to just update its own isolated scope, and avoid the digest of the entire scope tree. Choose your tools wisely. Yes, addEventListener is more efficient, but so is not using Angular in the first place! This results in a significant code increase and again you the benefit of Angular in doing so. Going back to raw DOM is always a trade-off. In the majority of cases, the raw DOM event model is a whole lot of additional work for little gain. In summary, I really think this post is about micro-optimisations that in many cases will not bring you the performance benefits you are looking for. Abraham’s summary suggests avoiding many of the most useful tools in Angular. If you have to roll your own framework code to avoid ng-repeat, or ng-click, you have already lost. How many TLDs is too many? So I got my usual daily email from $registrar today, telling me that my world is going to change and I just have to, have to, buy a new domain name from them for the today’s brave new TLD. Today’s must-have TLD is .website, and yesterday’s was probably .ninja. I’m offended on behalf of Samurai, because I wasn’t offered a .samurai domain. Today’s must-have TLD is .website. A morbid fascination caused me to click the link provided. I was given a list of 236 different TLDs, ranging in price from $8.98 for .uk (which, by the way, I can’t actually buy), all the way through to a princely $3059.99 for .healthcare. I was surprised that .dental was so affordable, at a mere $59.99. I have a few keyman. 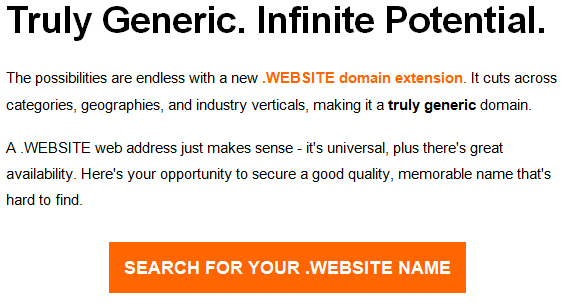 * domains already, purchased over the years before we managed to acquire our blue label keyman.com. It’d be nice to fill out the collection. So how much for the full set? Well, the full set of “New Domains” offered by one particular registrar, anyway. Today only, the full set will cost just $26,761.45. That’s doesn’t include most of those two letter country domains, .la and .io and .tv. Today only, the full set will cost just $26,761.45. My view is that every TLD issued now increases the value of keyman.com. I can’t see any way that the average small company is going to be blowing $25K a year on maintaining a set of worthless domains, just to prevent squatters or even to maintain a registered trademark. Some very large companies might find it worthwhile to register, e.g. microsoft.tax. But me? Nup. I’m not renewing some of my unused lower value domains, and you’re welcome to them. The gold rush is over people. 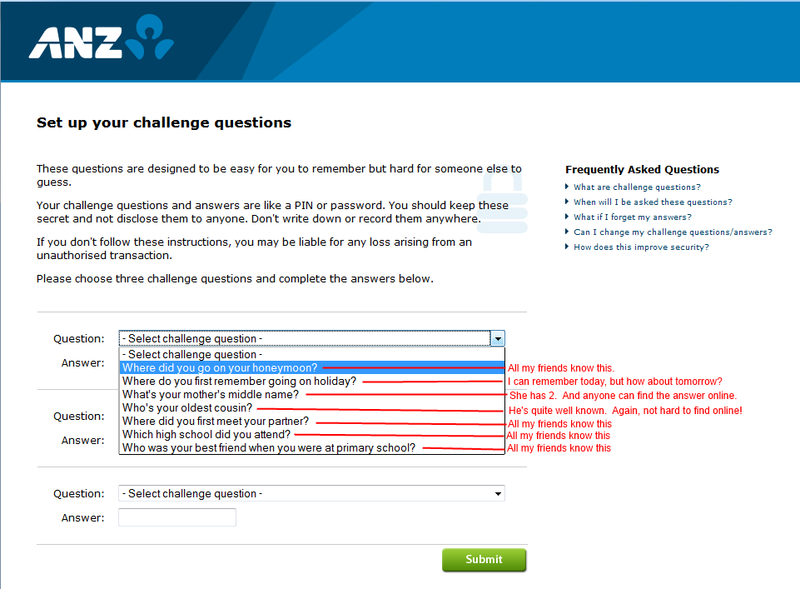 My bank has decided that I have to have some security challenge questions, and gave me a fixed set of questions to add answers to. If I actually attempt to give honest answers to the questions, any determined and reasonably intelligent hacker could find the answers to all the questions that I actually know the answer to, within a minute or two, online, tops. So what if I opt to use 1-Password or another password management tool to generate secure and random “password” style answers to these questions? These would not be readily memorisable and so I’d have to save them in the tool. But according to their little threat, I can’t do that! That’s called recording the answers to the questions and I could be liable if an unauthorised transfer occurs. The real problem with questions like this is that too much of this information is recorded online, already. It adds a layer of complexity to the security model, without actually improving security much, if at all. Then another question arises. If an acquaintance does happen to ask me where I got married, am I now liable to ANZ if I tell them? It sounds ridiculous but lawyers be lawyers. Mind you, given that I have no way of not agreeing to the terms, perhaps it’s unenforceable. The whole thing is really badly thought out. Update 9:46am: Blizzard and insecurity questions: My father’s middle name is vR2Ut1VNj is a really good read for more detail! 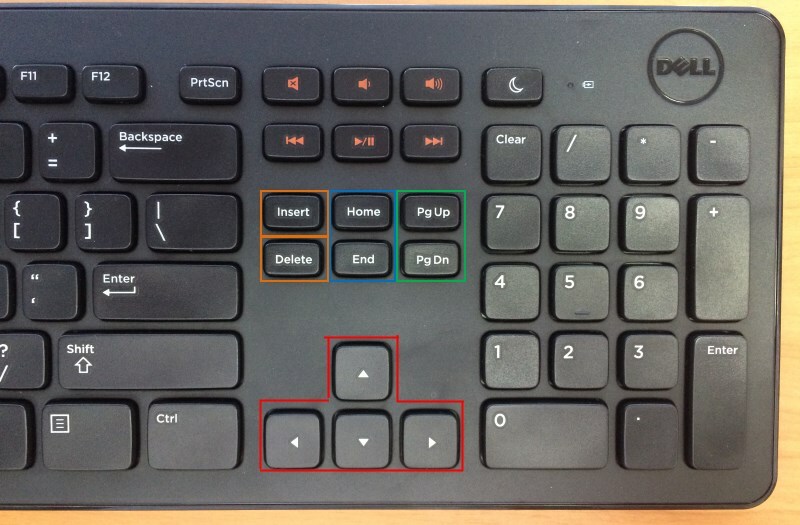 A follow-up post, 29 Sep 2014: Cursor Keys Have Not Improved. As you may know, I do a fair bit of work with keyboards. This means I have collected quite a number of hardware keyboards over the last few years. I do a lot of testing with various keyboards and use a number of computers with different hardware keyboards for both testing and development purposes. One of the more irritating issues I experience moving between these keyboards is in the way manufacturers keep rearranging the cursor key block. As a touch typist, I am continually pressing the wrong cursor key, or Delete instead of Home, and so on. And that’s just the desktop keyboards. When it comes to notebooks I have lost all hope. Eight keyboards. Can you spot the ones with identical cursor layouts? 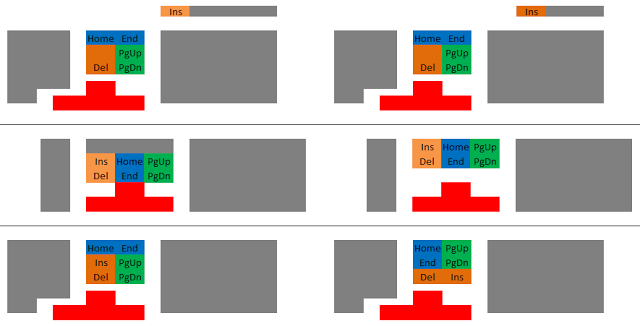 I drew up the six different layouts I found, grouping the keys by colour (sorry if you are colour blind). 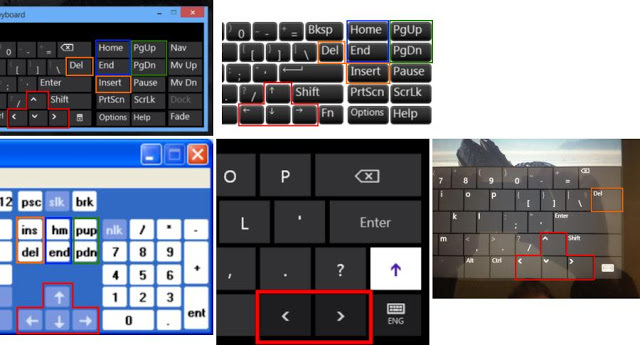 The top two layouts seem to be where most keyboards are going today. The middle two are more traditional, and the final two layouts were invented, I am convinced, purely to cause me grief. I aligned the layout diagrams with the right hand side of the main alphanumeric keyboard block: this reflects where my hands sit normally. I hardly need to explain the difficulties with the constant rearrangement of the Home, End, PgUp, PgDn, Ins and Del keys, but I will note that the inconsistency of the cursor block position is almost as much of a problem: I get used to the position of the down arrow key on one keyboard, switch to another keyboard and find myself hitting left arrow instead from muscle memory. Even soft keyboards suffer. The following 5 images are all from the same company, Microsoft. 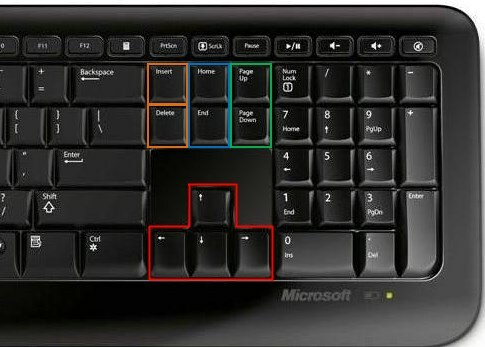 Of note is that the position of the Fn key changes between Windows 7 and Windows 8. In 3 of the images, the position of the up arrow key is just slightly misaligned with the down arrow; this may not be a problem in use but it is visually irritating! Windows XP, Win 8 Touch Optimised, Win 8 Touch Full.